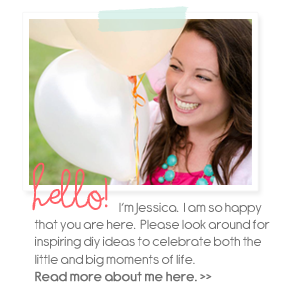 I'm sure you have noticed my blog recently got a tiny makeover with my new happy banner. 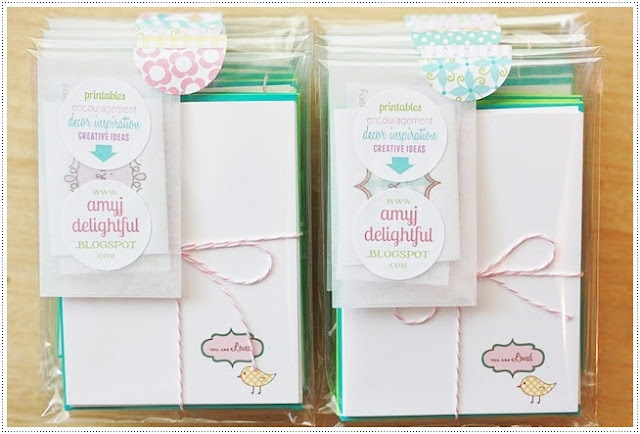 Well I am excited to introduce you to the lovely Amy J. from Delightful Distractions who made it for me! Amy started following my blog a little while back and as always...I need to peek in everyone's blog who decides to follow me....and the moment I did...I was hooked. Amy's incredible blog is chock full of her incredible sense of style, graphic design skills, and inspiration galore. 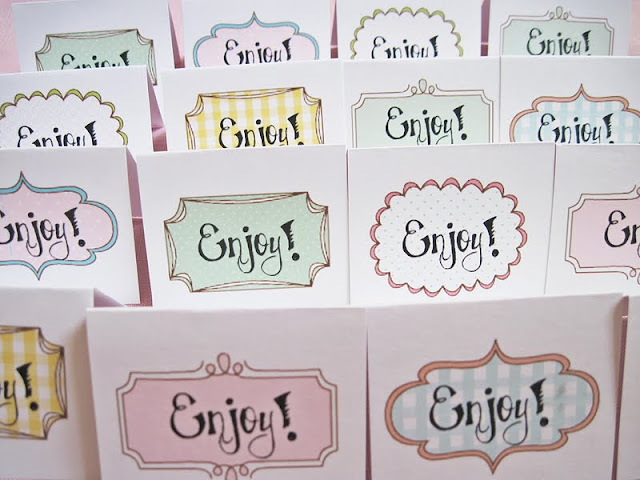 Plus...she exudes oodles of friendliness and warmth in her writing voice with her transparent posts. Oh and read her twins story but grab a box of tissues. An incredible testimony and her faith encourages me so much. After seeing some of her Etsy shop and graphic design talent I was completely in love! I knew we shared some of the same design tastes. She combines a delightful merging of a love for vintage with a fresh modern feel. I am in such awe of her skills which prompted me to ask her if she had ever considered blog design. When she decided to work with me I felt like it was Christmas morning! I can't tell you how happy I am with my perfect banner and buttons. I love how they illustrate my love of garlands, birds, and lots of color! It makes me happy every time I see it! And for icing on the cake...she was amazing to work with...so patient and really saw my style immediately! 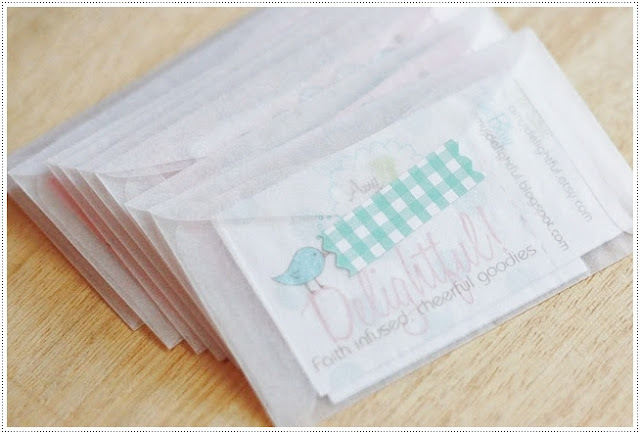 She is also VERY crafty and I absolutely love how she shows us how to make our own washi tape out of mailing labels using one of her many lovely free printables. 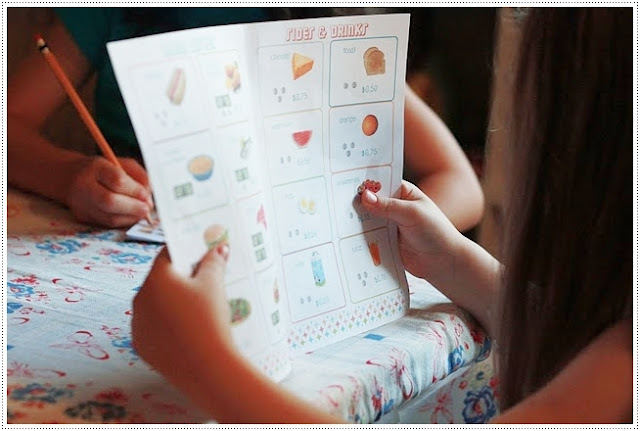 Oh and these adorable printable menus to play restaurant with the kiddos! 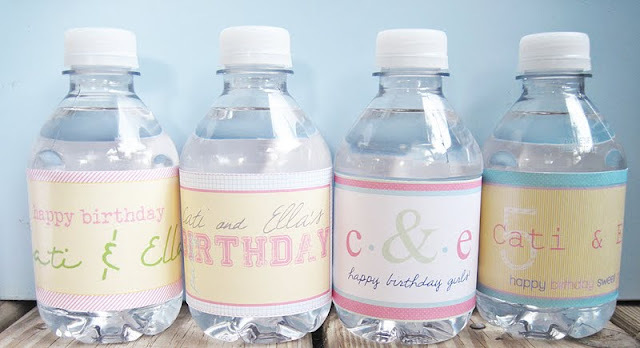 Or these perfectly sweet labels that I used for the girl's picnic party! And such brilliance sharing ideas like using old books as picture frame mats covered in fabric! 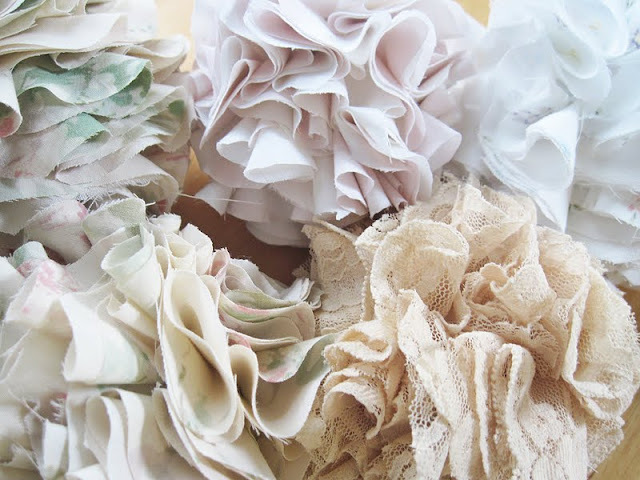 Now if that does not speak to my fabric loving heart...I don't know what does! And her decor style...oh be still my heart! Fresh vintage style again. 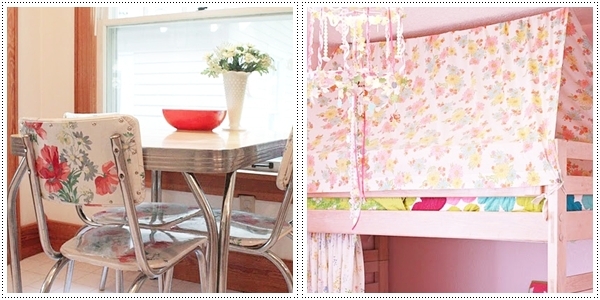 I love Amy's idea to cover those chrome legged kitchen chairs with a vintage tablecloth that her mother in law helped cover. Brilliant! Or her daughter's gorgeous bedroom! 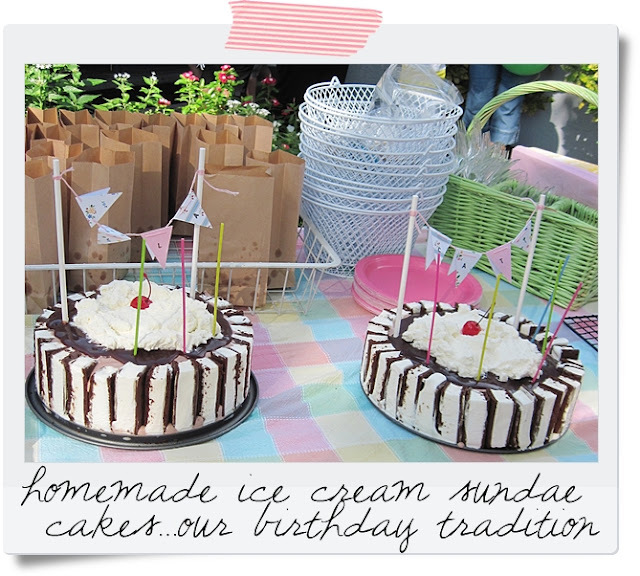 Seriously, I could stare at her blog all day. Please say hello to the lovely Amy. P.S. 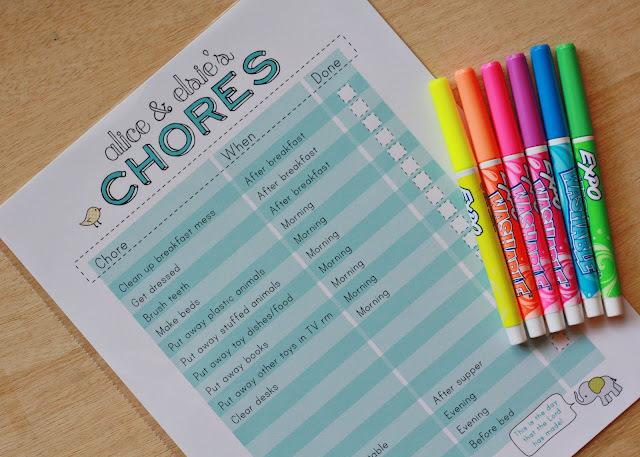 She even has an awesome new chore chart printable. I promise I have not been trapped under something heavy in my absence. I seriously have so many behind the scenes things I have been working on...various projects that I hope to share with you soon. I have even been...ready? 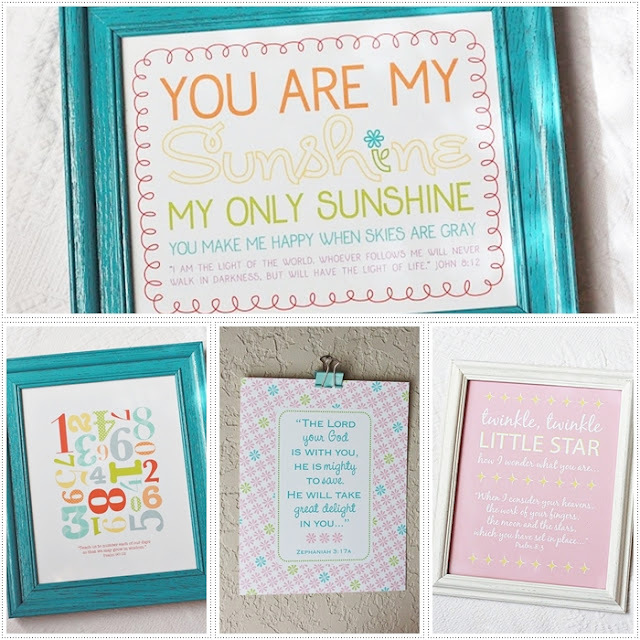 Organizing and decorating my new...CRAFT/HOMESCHOOL ROOM! Not to mention school starts for my oldest and both my girls are playing soccer. I am just plain old busy. 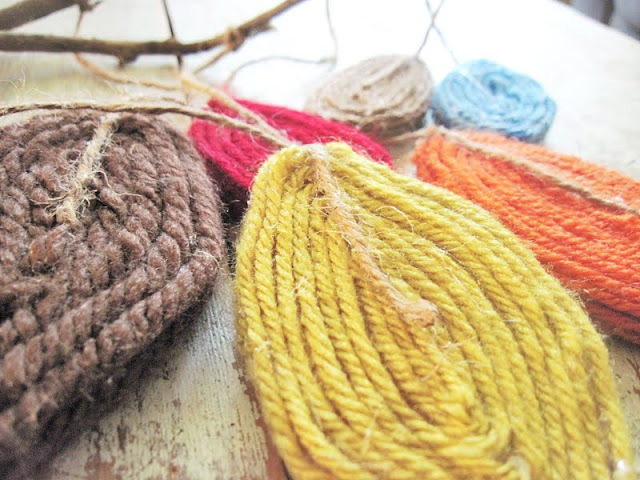 But I figured I could share some crafts I did last year for Fall. It's my favorite, most happy inducing time of year! But being in sunny Florida I gotta put forth the effort to make it feel like Fall. I even make it smell all cinnamony. Or sporting the fake pumpkins outside (boo to that). Real ones would be a squishy mess in a week. I should call the Fall decor inside of my house "Autumn Erupted" or something. And I do get real pumpkins at the pumpkin patch and put them inside. I need the real pumpkins. 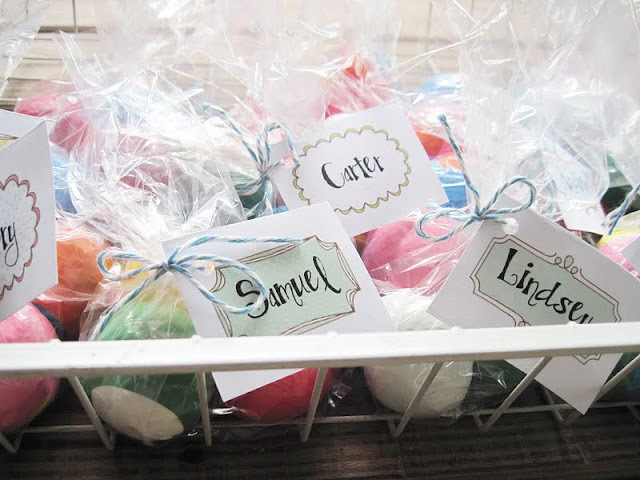 I was one of the room mom's for Cati's class last year and got to do the parties. The first one I did was an apple theme. I think fruit themed decorating has untapped happiness potential. 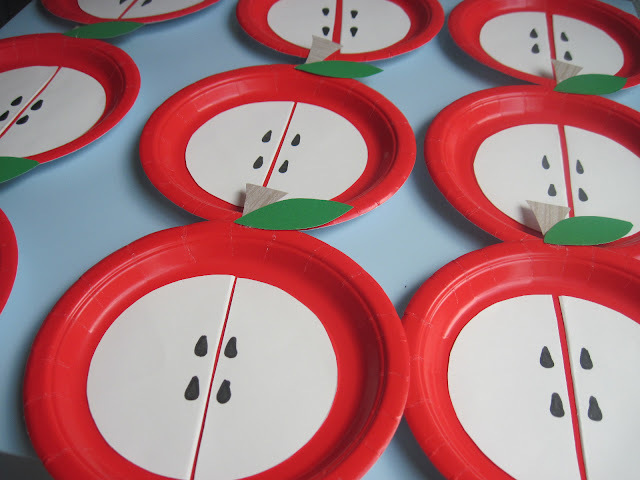 :) These are just regular dollar store plates and I used white, green, and tan card stock to make them into apples and a little sharpie for the seeds. 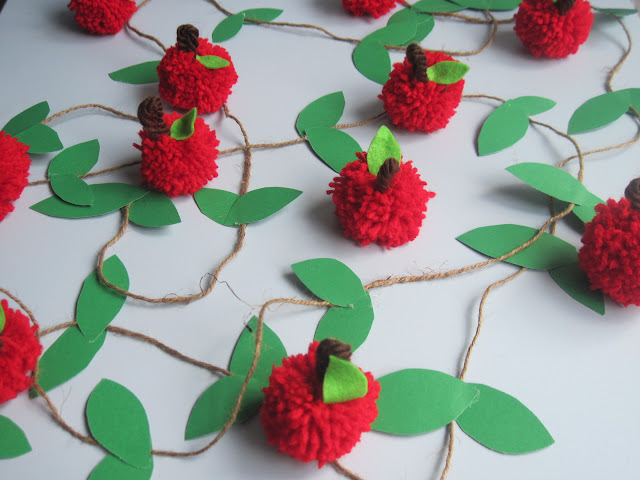 Who would not love a pom pom apple and some twine with paper leaves? Simple too. 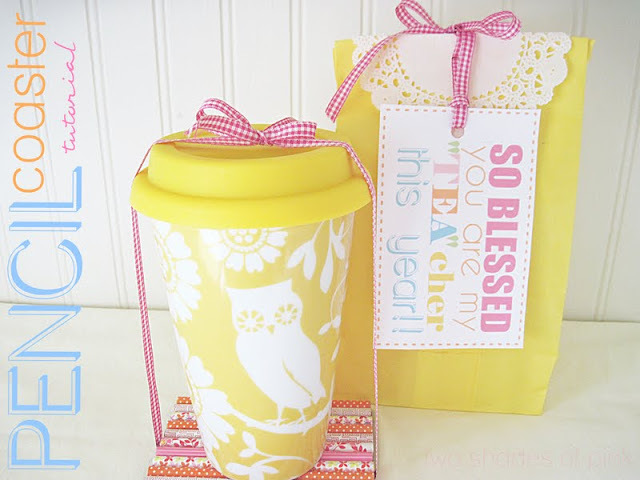 You can check out those crafts posts here. 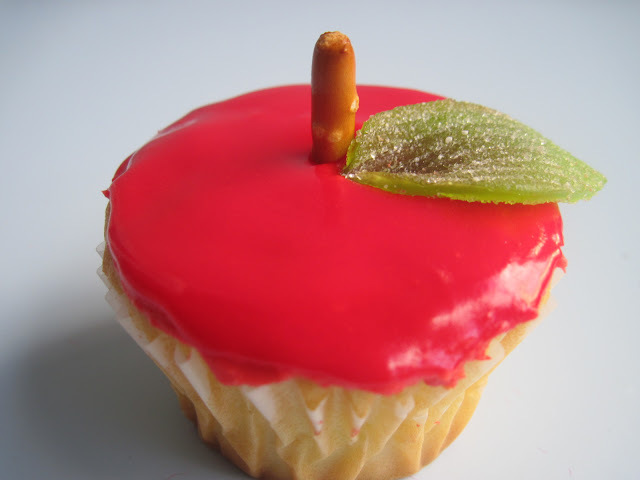 These were made with a combination of cake icing and cookie icing (to make them look like shiny apples) pretzels for the stems, and RIPS candy cut into leaves. Peek in on this one here. 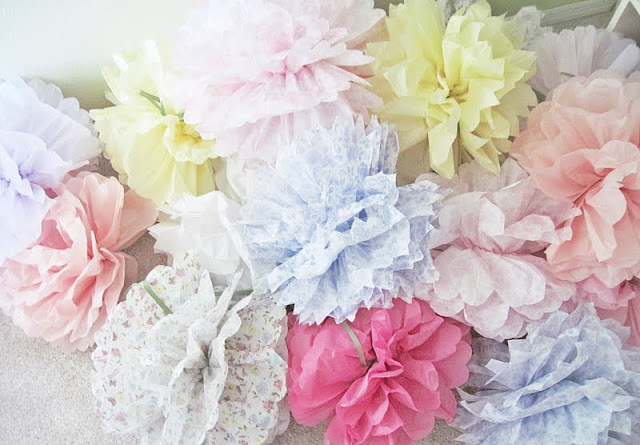 Hope this leaves you with a little bit of inspiration (even though they are oldies but goodies) and to assure you that I am still here doing my crafty thing. Hey friends! I have missed you! The first thing on my craft agenda is this cute gift for Cati's kindergarten teacher. For those of you new to reading my blog, Cati attends a small Christian school where she attend 3 days a week and then I homeschool her 2 days a week. The school is set up this way and all the families follow this curriculum with their children. We love it. And because we are a small school, we all know each other and Cati already knows her teacher and she knows her. Which is NICE! 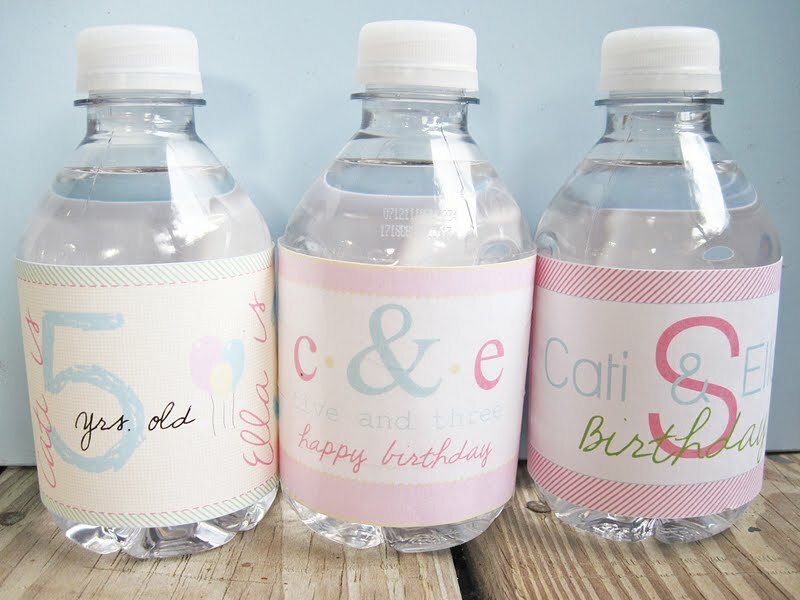 So I happen to know that her teacher is an avid scrapbooker and appreciates a little creativity. I decided to make her a gift just to bless her as we come back to school to start the new year. I for one appreciate all the hard work teachers invest and I want her to know we appreciate and pray for her. I love rain and thunderstorms. A whole lot. So it is a big deal that I am a little mad at Cumulonimbus right now. Oh you may know him as Rain but I think our tight relationship gives me due cause to call him by his proper name. Like how everyone calls my oldest Cati but I usually call her Caitlyn or CATE when I am not happy. And Cumulonimbus caused quite a stir on Saturday as I finished decorating for the girl's birthday party and he decided to show up as soon as I was done. And he was SO not invited. But thankfully, as I commenced my breathing in and out of a paper bag...he decided to not overstay his welcome in time for the party. YIPPEE! And Y'all? It was HOT. Here are only a few shots that I could get. They are not very good so I fancied them up a bit to make them fun and hide the fact that there are only a few. I was attempting to be a good hostess and prevent my friends and family from melting. 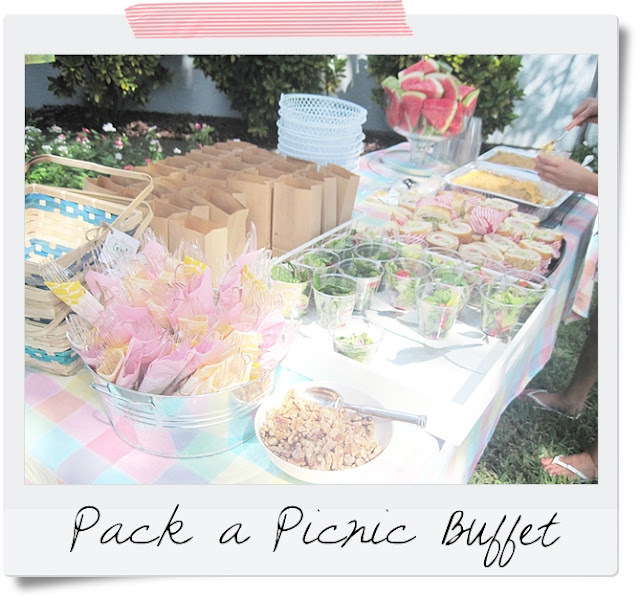 Oh and the above photo is the table where everyone could make a picnic basket and take it back to their blanket. Fun, right? The striped wax paper gives these a totally cute, homey look. Loved how they turned out! I got here too late to snap a photo. The kids literally swarmed me when I brought out the lemonade in mason jars. This is what was left on a little end table that usually happily sits in my living room. I meant to make a drinks sign but you gotta just know when to quit. The open drawers for the waters was a pretty nifty idea and I think I will do that again for some other entertaining endeavor I do. 8 Ice cream sandwiches and 1/2 gallon of ice cream (I used chocolate) and a spring form pan. For real. That is it. How stinkin simple is that? The tricky part is the prep and only because things melt fast. 1. Cut you ice cream sandwiches in fourths. First lengthwise and then across to make four pieces each. The way I did this is to clear out the freezer for the cake(s) and then set a plate inside the freezer. 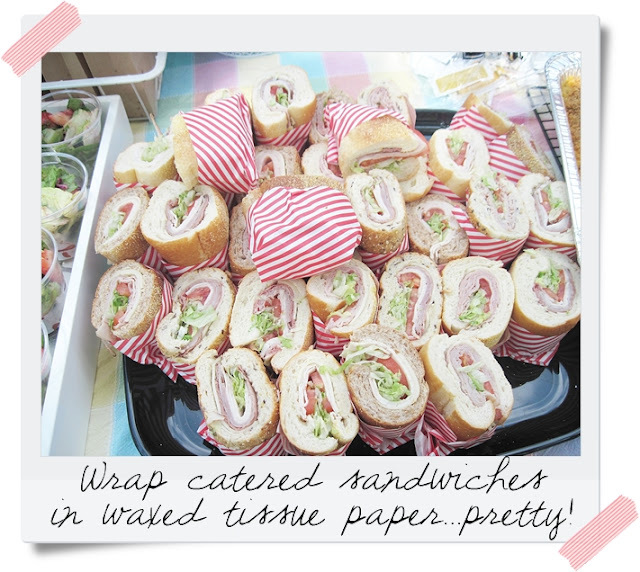 I grabbed each sandwich one at a time and cut them and placed the cut pieces back onto the plate each time. 2. After they are all cut, begin lining them up around your spring from pan. It depends on what kind of pan you have but I recommend you keep it unlocked when doing this. Push each piece really close together, lock it and then put the spring form pan back in the freezer. 3. Thaw out your ice cream a bit on the counter to soften it up and then take out your spring form pan, and fill up the center with all the ice cream. I smoothed the top out and then froze it overnight. 4. I chose to put the hot fudge on it early and then freeze it again but you can do this right before serving (or whatever topping you would like). I made homemade whipped cream using whipping cream, confectioners sugar and a splash of vanilla. I eye ball everything. And then topped it off with a cherry. Release it from the spring from pan right before you top it and serve. 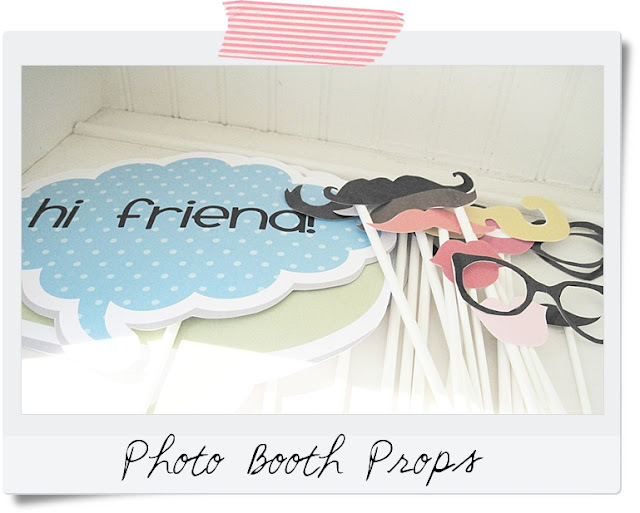 At the last minute, I decided to do a photo booth. 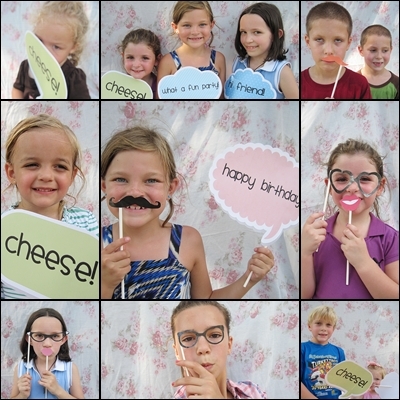 I downloaded some fun mustache and glasses props and covered them with clear contact paper so they would last the whole party. I also made signs from some bubble labels I had already downloaded to feed my love of digital things. I put fun messages on the bubble labels, sized and printed them out and hot glued them to white cookie sticks. I found them at the Friendly Scrap and you can find the direct link for them here. Here is a link to download the Colorful Lips & Mustache Set by The Paper Dolls Shop at Catch my Party. Oh Happy Day and this one too! The kids looked so cute and had a blast with them! My lovely friend, Shelya, who is a professional photographer brought the background screen for me to use. She is such a sweetie! And the cutie girl in the bottom center, who should seriously have been paid $100 for all her help at the party, took all the photos of the kids. She did AMAZING! And some shots of my girls I got at a restaurant. This was the end of their party packed birthday weekend. 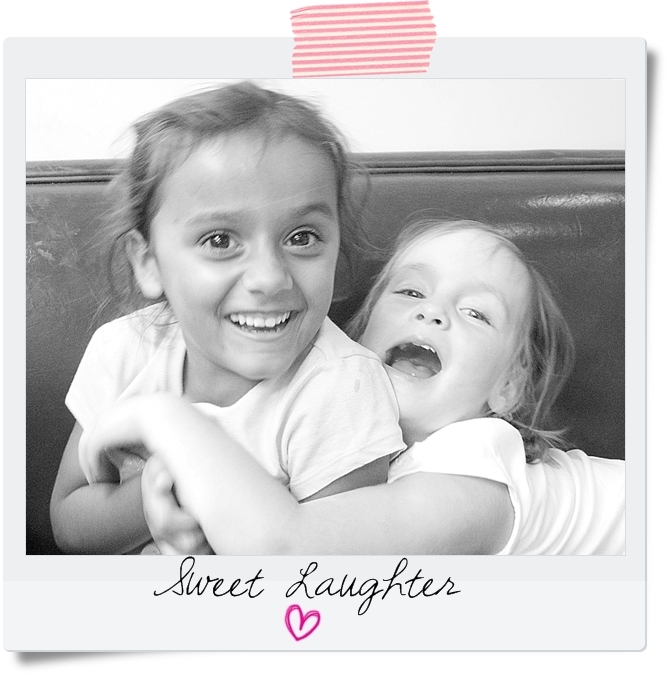 Happy Birthday to my precious, sweet girls. When I have more photos to show you...I will. But hopefully I will have new projects to share soon! 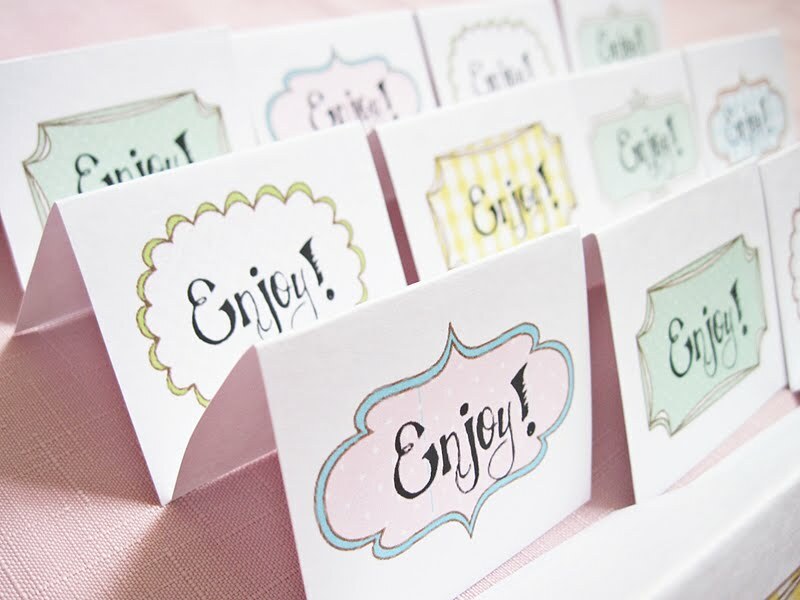 Favors and Decorations, and Pretty Things...Oh My! I know. It probably makes no sense that I take a two week hiatus and then just launch into a post like nothing happened. I have to tell you I needed that break. 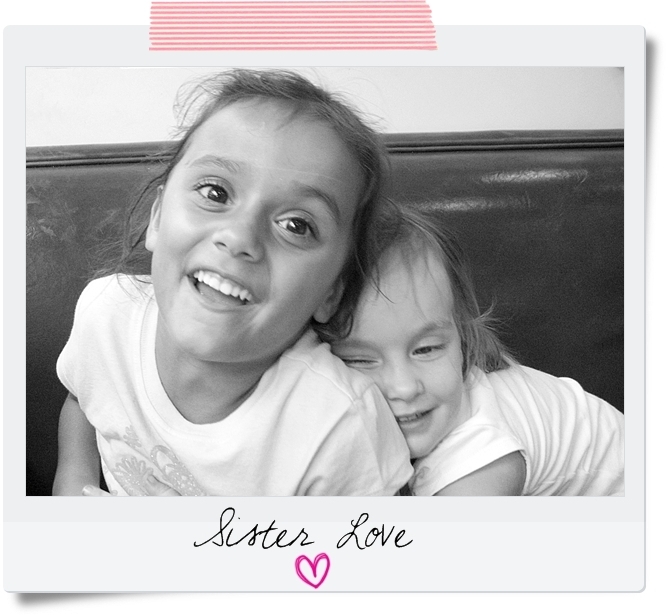 I know it sounds crazy but as my girls both had approaching birthdays I was suddenly hit with the finality of MOMENTS. Call it a moment of clarity. That these precious moments can pass without you even noticing and there is no getting them back. I would look into those sweet faces and realize that time is literally warp speeding by me. My Ella just had her 3rd birthday this past Friday. Which prompted this clarity I was referring to. I am still wrapping my mind around my youngest child being 3. No longer a baby. Lord willing, we will have more babies. Whether biological or adopted...I have no idea. But we want more children. And I have been hit with the fact that mine are just...GROWING. Like all the time. And I can't stop it. But I sure can enjoy the ride. So. That is what I have been up to. Just enjoying my two girlies and loving my life. 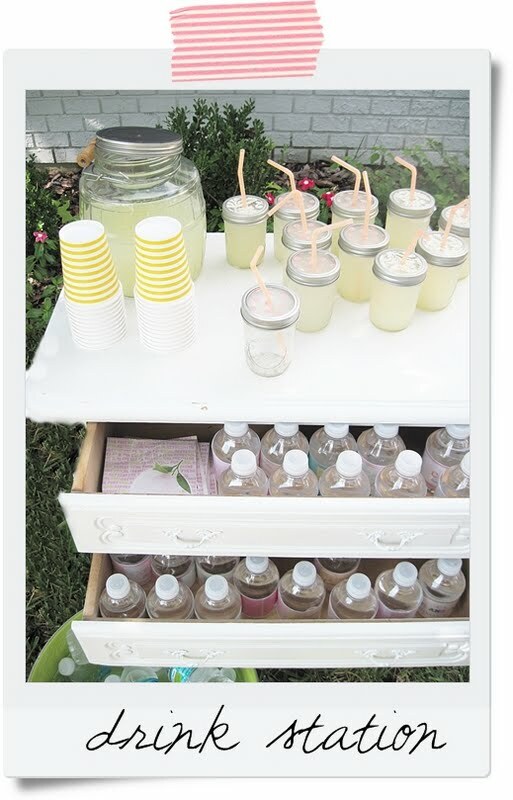 But in the meantime...I have also been hard at work preparing for this upcoming picnic party. I don't have tutorials for you but I will share some photos of the things I have made. I plan on hanging them from our big tree in the front yard. These cuties are much smaller and I was also going to hang these from the trees. But I did not make a lot (a little bit more time consuming) so I may not use them. But who knows...so I included them for you to get a peek! 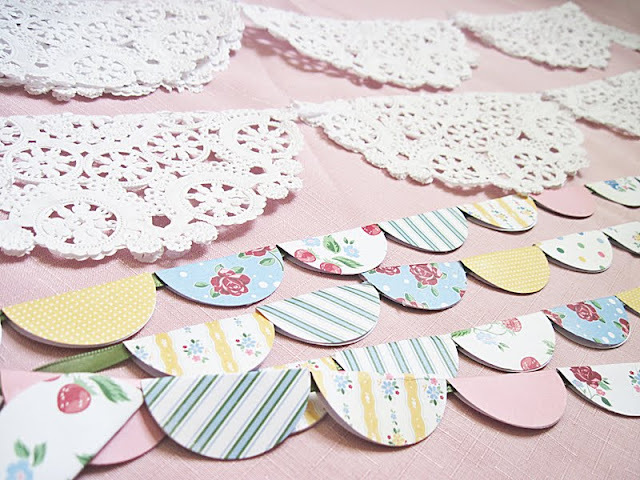 Paper doilies and scalloped garland made from a 2 inch circle punch with each circle folded over ribbon. 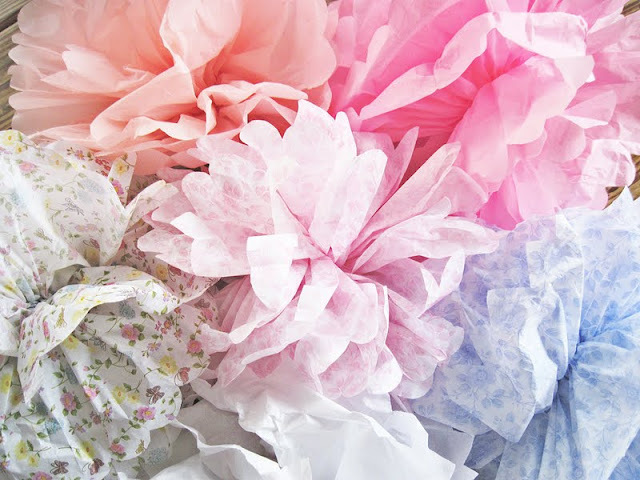 I used the paper that I used for the paper fans. These were fun. I customized these in power point from a template that I got from another blog awhile back and I can not remember where. I actually only wanted it for the measurements. When I find it, I will put the link back here on the post. I am too cheap to buy the waterproof label paper so I just wrapped them in packing tape. I confess it looks a little ghetto on some of them but...whatever. I found these at the dollar tree and I plan on serving each FAMILY their picnic dinner in them and labeling them for a personal touch. 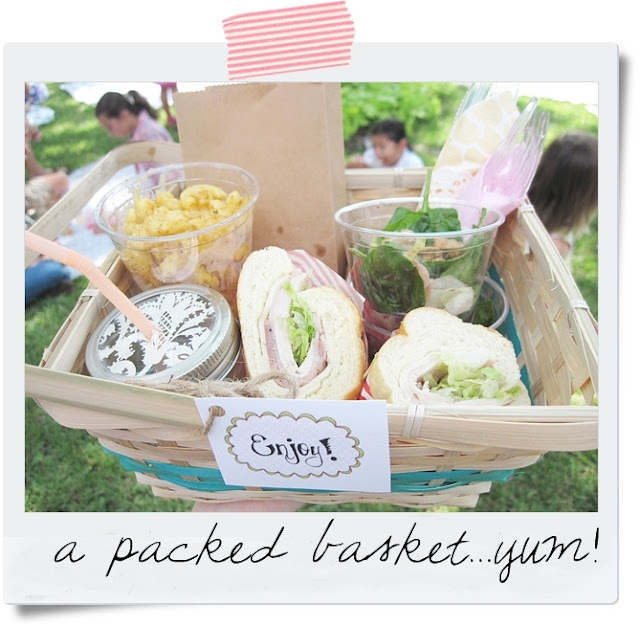 I initially wanted to serve everyone their picnic in boxes wrapped in twine but my husband convinced me this would have been a stressful prepping situation. 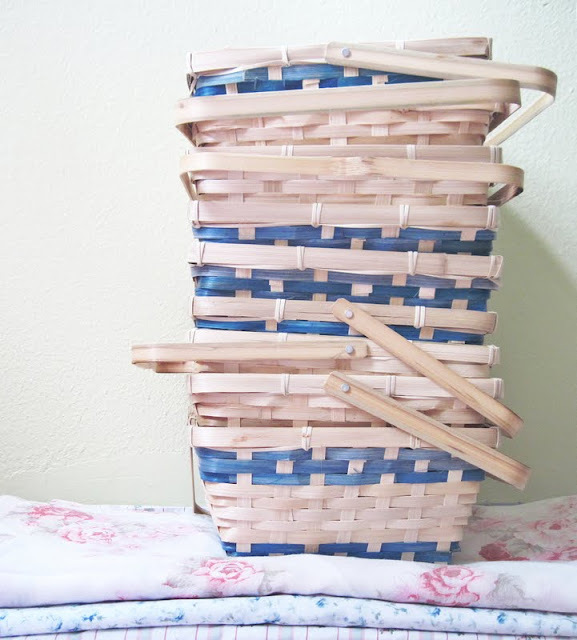 I really think the family baskets will be so cute! 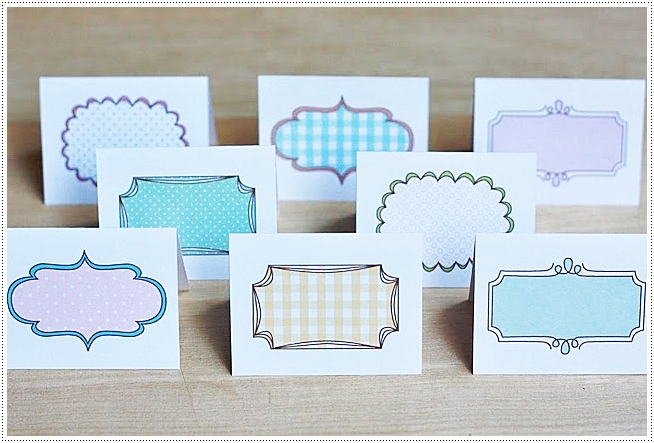 Printable Labels from one of my favorite blogs...I will be introducing her to you VERY soon! I got this idea from Family Fun. They are made with two 9 inch balloons with the necks cut off and rice inside. Using a funnel, fill up one balloon with rice, snip the neck. Then take another empty balloon, snip the neck off that one and stretch it over the filled one. 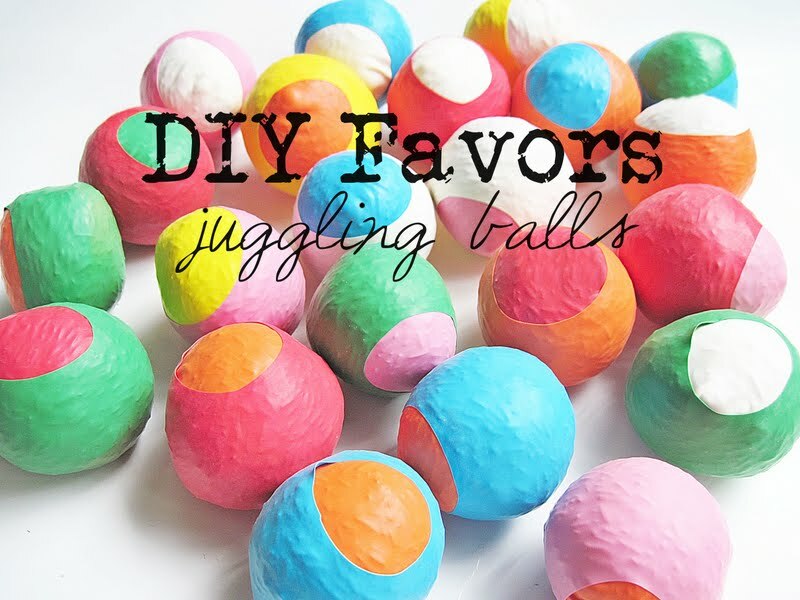 These favors will be juggling balls for the boys and I think I may add chalk for the girls for hopscotch sets. I really wanted to make fabric bean bags for the girls but I made way too many juggling balls and again...trying to find BALANCE. 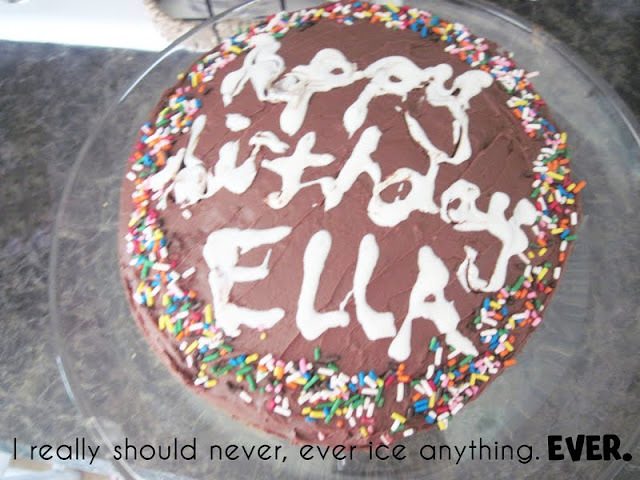 And FINALLY...for your entertainment at my total expense...here is the cake Ella and I made for her actual birthday. Mistake 1: Using a cookie icing pen I happened to just find in the pantry. Expiration date unknown. Mistake 2: Putting lid on cake plate before icing set. Hence letters that look creepy instead of happy. Mistake 3: Attempting to fix letters with toothpick to regain legibility and royally messing it up even more. Mistake 4: Not remembering my 3 year old can not read. That is about it on what I have been up to. 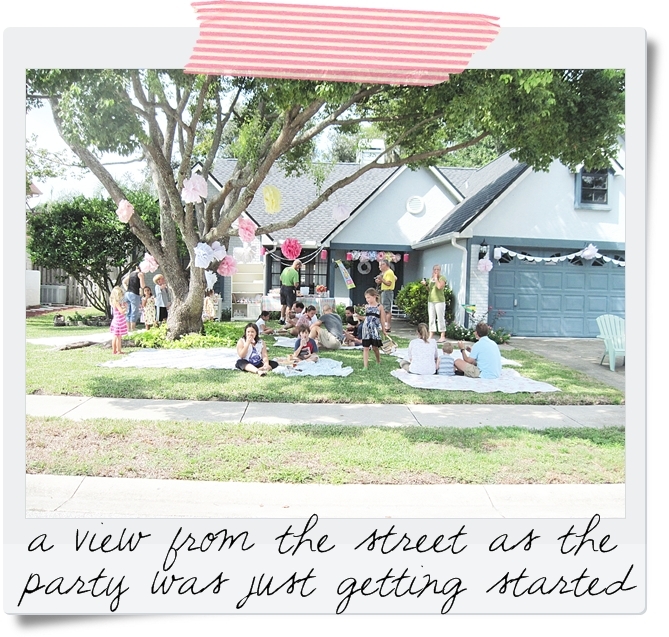 The party is this Saturday and I hope upon hope I have the time to photograph it for you. And I am also PRAYING THIS TROPICAL STORM NAMED EMILY (love that name, not the storm) MOVES FAR, FAR, FAR, INTO THE OCEAN AND AWAY FROM FLORIDA so that I don't have to move fifty people into my lovingly quaint but small house. Or move them into my even smaller laundry room for shelter. I will have family in town this week so you may not hear from me until next week some time. 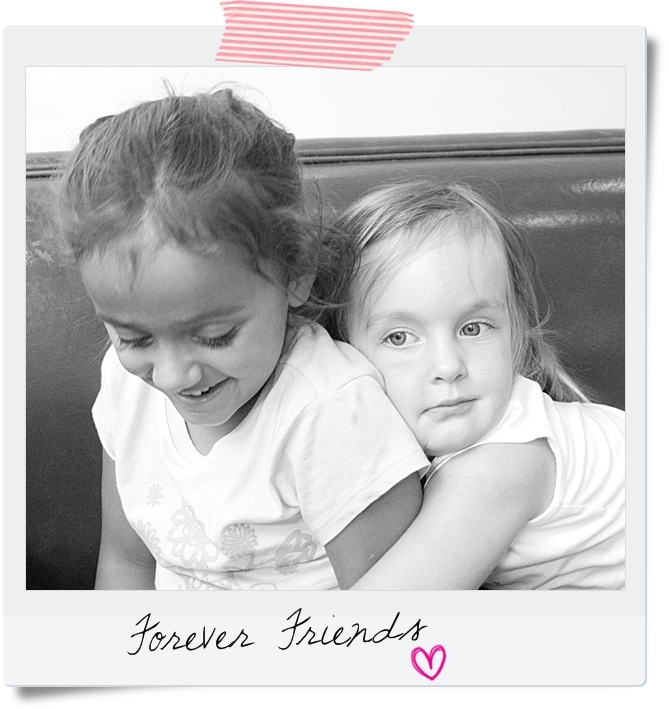 Hugs to each of you! I have truly missed you!